Last night after HSM we ran over to Chipotle for a quick burrito and hang time. Fields, his kids and some of their friends were there, and little did we know we were about to a brush with celebrity. Just a couple of tables over from us was former tennis champion Michael Chang. Chang is still very much in the news these days (226 stories on Google News currently) with the retirement of Andre Agassi. So how cool is that? Doug had met him one time previously and noted that many of the family were believers as well. A quick look at his official site and you’ll find a Bible verse and evident faith. But here’s the icing on the cake. As Chang was leaving, he came over to our table! He acknowledged a greeting to Doug, and introduced himself to our table. Very cool. He was super gracious, especially when others in line then recognized him and made a little commotion, too. All in all, that was a great experience. 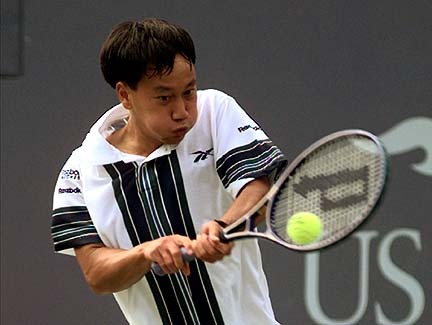 a) getting an excellent burrito, b) conning Fields into paying for it, c) meeting Michael Chang and d) having Chang come over to our table to say “hey” to Fields. Wild. So how high do you rate when everyone is gawking at a celebrity and then the celebrity comes over to talk to YOU. Nice. I haven’t had that problem yet, for some reason. Hmmm ….